Based on the high precision time-series data from Kepler Space Telescope, Xinjiang Astronomical Observatory Optical Group Prof. Aili Esamuding et al. reported a weak modulation effect in a double-mode high-amplitude delta Scuti (HADS) star. This work has been published in The Astrophysical Journal(ApJ，2018，863，195). HADS stars are typical late-A or early-F pulsators, located in the intersection of the main sequence and the classical instability. Their oscillation periods are between 1 and 6 h, and the peak-to-peak amplitudes are usually larger than 0.3 mag. Their pulsation modes are relatively simple, generally showing mono- or double radial modes. 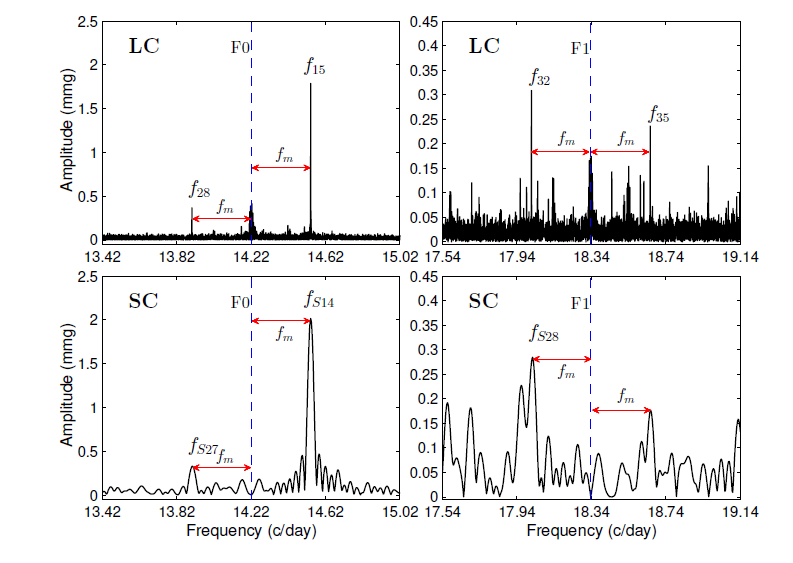 The researchers presented an in-depth frequency analysis for both the long and short cadence data of HADS star KIC 5950759 delivered from Kepler Space Telescope, and detected three independent frequencies. Based on the fact that the first two are the main frequencies: F0 = 14.221373(21) cycle/day，F1 = 18.337249(44) cycle/day, the third independent frequency fm = 0.3193 cycle/day is detected for the first time. In addition, A modulation of fm to F0 and F1 modes (triplet structures centered on F0 and F1) are detected both in long and short cadence data, as shown in the figure. This is the first detection of the modulation effect in a double-mode HADS star. They discussed the origin of this modulation, and the most possible cause of the modulation effect in the light curve is amplitude modulation with star’s rotation frequency of 0.3193 cycle/day. The detection of the weak modulation benefit from the high-precision, un-interrupted and long-time observations provided by Kepler Space Telescope. Figure：Amplitude spectra of modulation frequency fm to main frequencies F0 and F1. The blue dashed lines indicate the locations of the main frequencies of KIC 5950759. The space of the triplet structure spectra lines are indicated with fm.